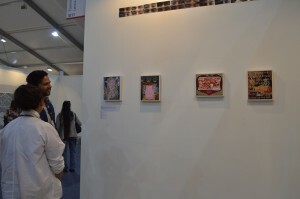 The India Art Fair 2016 was recently held at the INSC grounds in New Delhi, between 28th and 31st January. It brought forth for viewers a variety of works ranging from modern to contemporary, displayed at gallery booths and sections such as Platform, Focus, Institutional and Art Projects. Amidst the melange of works of art was Taseer Gallery, which presented contemporary art from Pakistan with a specific focus on Lahore. The works of Saba Khan, a young artist based in Lahore, found their much deserved niche at Taseer Gallery ‘s booth. In continuation with her engagement with critical comments on the urban social milieu, the works reflected the artist’s social criticism with undertones of satire. Comfortably spaced on the wall, each of the four works, sized eight inches by inches in mixed media on canvas, claimed independent attention. From a distance though they seemed to form a cohesion in meaning and visual experience, of the artist’s message on the shifting and fluctuating socio-cultural life of the elite in Lahore. At the core of Saba’s works lies her approach to comment making and communicating. Both the material and its materiality play a key role here. 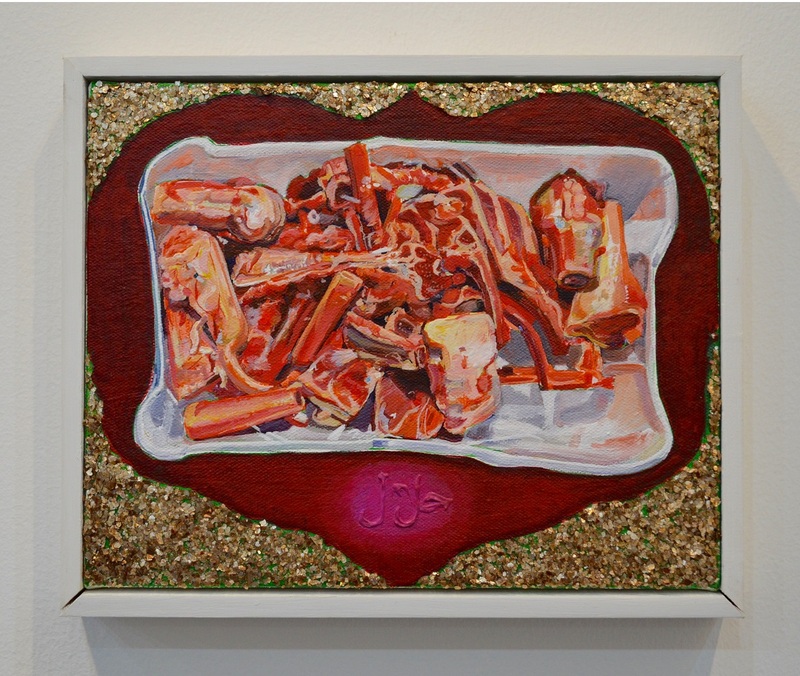 As in works such as Feeling Pious Today (2016), the colourful crystals make visible a hijab-clad woman whose simplistic aura is replicated with ornateness. Piousness is portrayed ironically, by creating the ‘pious woman’ with shimmering materials. This twist in the association between the form and the material of creation, helps her build layers of contextual meaning. She further accentuates the sarcasm, partnering it with the title of the work, which builds upon the desired irony. 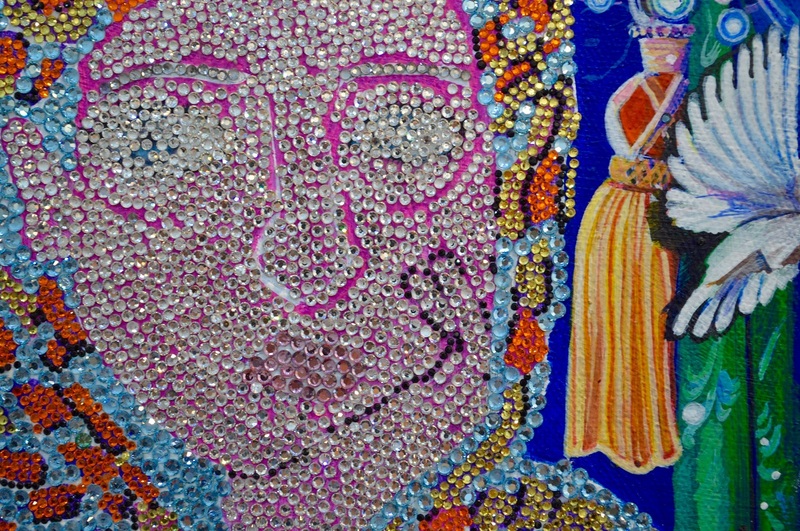 The visual immediacy of the materials such as glitter, mica and colourful beads at first bring a sense of kitsch to her worksand almost brings us to believe in a sense of decorativeness. But soon the viewer detours towards a deeper meaning which is embedded therein. Material becomes her tool to lament, to joke, to tease and to make visible the under layers of human life. This personal commentary upon materialism (in social life) through the materials itself is also evident in works such as Waiting for the Suitable Boy (2016), Halal Dreams (2016) and Mama’s Boy (2016), which were also on view. 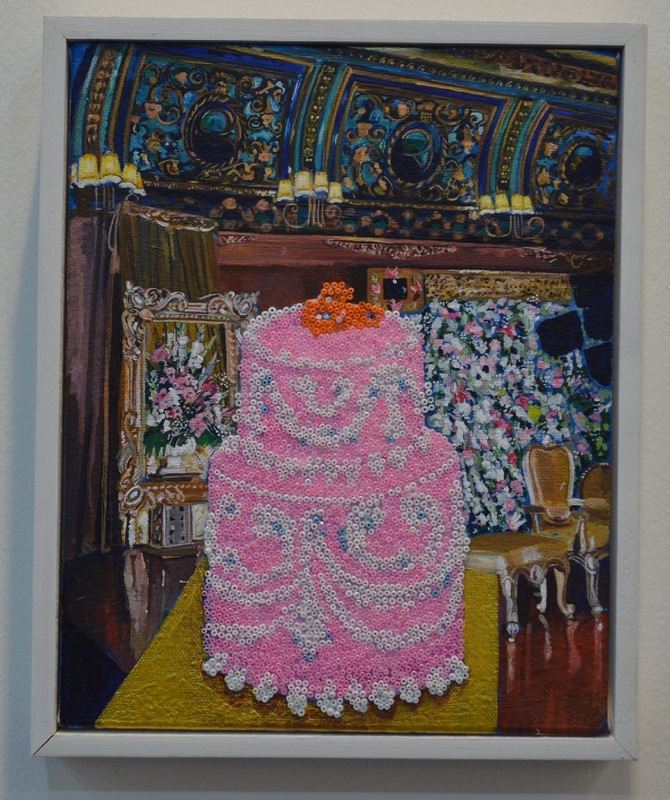 She brings in the baroqueness of the urban living rooms as backgrounds in acrylic paint, into which she introduces the beads and glitter to highlight and make conspicuous an object in context, from the same space. The wedding cake, the meaty delicacy and the memories of living in the ornate interior of a drawing room, surface as icons. It is furthered paradoxically by the tactile quality of the plastic materials, which despite their very physicality, seem to have a sense of artificiality to them. Subtly, Saba’s works invite us to view and re-view them in their delicateness and intricacy. The layers of meaning and materials superimposed in a small frame, withhold the desires, lifestyle and etiquettes of the high social strata to which she responds. 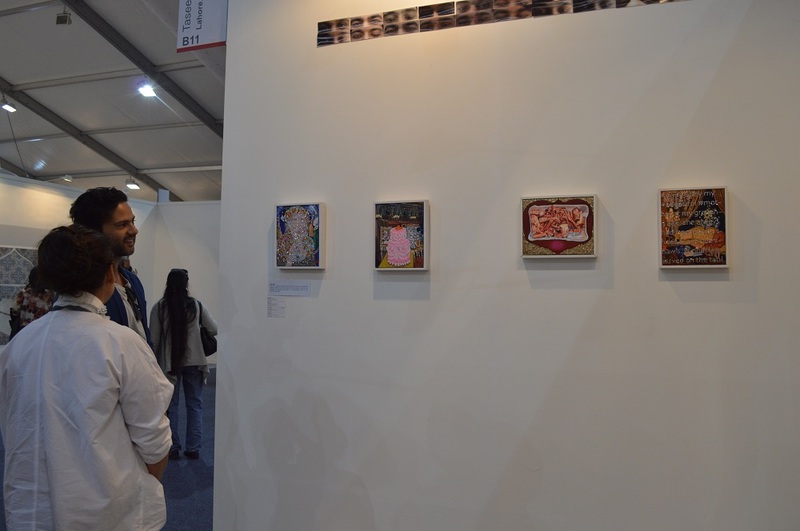 Works by Saba Khan, Taseer Gallery Booth, India Art Fair 2016, New Delhi, 28-31 January 2016. Dr. Ruchika Wason Singh is visual artist and associate professor at the College of Art, New Delhi.